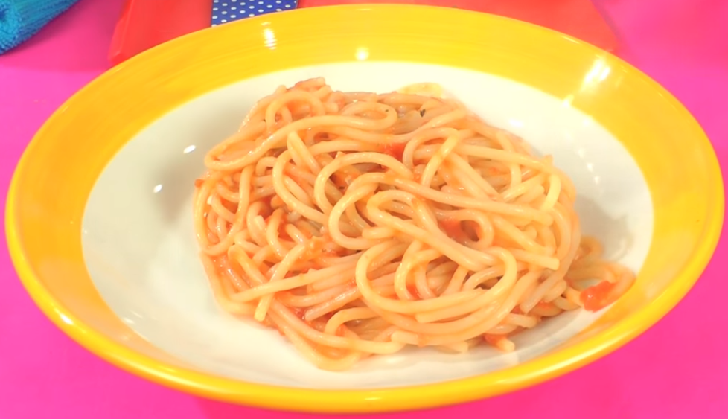 This Quick Spaghetti, interestingly, also stays fresh in the tiffin box for more than 4 hours, so you can comfortably send it to school or office too! ➧Heat the oil in a broad non-stick, add the onions and garlic paste and sauté on a medium flame for 1 to 2 minutes. ➧Add the capsicum and sauté on a medium flame for 1 minute. ➧Add the tomatoes and 2 tbsp. of water, mix well and cook on a medium flame for 2 to 3 minutes while stirring occasionally. ➧Add the sweet corn, tomato ketchup, chili powder, and salt, mix well and cook on a medium flame for 1 to 2 minutes, while stirring occasionally.